888 Poker has fine-tuned its daily Fish ´N´ Chips tournament schedule by replacing some of the existing menu with new BIG Fish tournaments. The six new tournaments have buy-ins starting at $5.50, guaranteed prize pools totalling $100,000, and are being supported by a very generous satellite schedule. As regular players at 888 Poker will be aware, a lot of the site´s low buy-in tournaments appear on a “Fish ´N´ Chips” menu. Tournaments with a buy-in of $1.00 are “Goldfish” events, those with a $5.00 buy-in are “Blowfish” events, and the pattern continues for “Catfish” events (buy-in $12.00), “Starfish” events (buy-in $22.00) and “Swordfish” events (buy-in $30.00). Within each buy-in, there is a good variety of tournament formats (freezeout, turbo, deepstack, re-buy, etc.) and some decent guaranteed prize pools – sometimes as high as 5,000x the buy-in. Now 888 Poker has selected six of its most popular fish-themed tournaments and re-branded them as a BIG Fish series – slightly increasing the buy-ins, but significantly increasing the guarantees. BIG Fish #1 gets underway at 3:00pm (all times BST – for CET add one hour). It has a buy-in of $5.50, a guaranteed prize pool of $5,000, and a late registration period of 130 minutes during which a maximum of five re-entries is allowed. BIG Fish #2 is scheduled to start at 4:30pm. This event has a buy-in of $33.00, a guaranteed prize pool of $15,000 and a late registration period of 200 minutes – by the end of which the starting stack of 5,000 chips will be the equivalent of ten big blinds. BIG Fish #3 at 6:30pm is a mirror of #1 other than a much bigger guaranteed prize pool of $15,000 for the same buy-in of $5.50. This tournament starts at 6:30pm and has the same opportunities to re-buy if you are eliminated within the 130 minutes of late registration. BIG Fish #4 is a $16.50 buy-in tournament that gets underway at 7:00pm. As with its predecessors, you can re-enter up to five times in pursuit of a share of the $20,000 guaranteed prize, provided you fire your re-entry bullets within the 150 minutes of late registration. BIG Fish #5 is the feature event of the nightly series and is scheduled to start at 7:30pm. This event has a buy-in of $33.00, a guaranteed prize pool of $35,000 and 200 minutes of late registration. Although worth playing in, it but could be a late finish if you run deep. 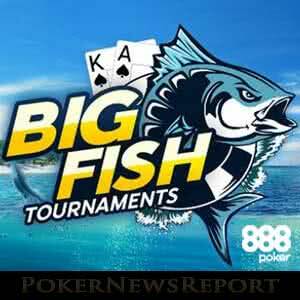 BIG Fish #6 has been scheduled at 9:30pm (with 2½ hours of late registration) for players who miss the late registration periods of previous events. Surprisingly not a Turbo event, this tournament has a $16.50 buy-in and a guaranteed prize pool of $10,000. The start times for the three most valuable BIG Fish tournaments are very close to the start times for the first daily events in 888 Poker´s forthcoming XL Inferno series (which starts next Thursday 10th May). The cynical among us could be forgiven for thinking the previous “Blowfish”, “Catfish” and “Swordfish” tournaments that have been replaced by the BIG Fish tournaments would have generated prize pools similar to those being guaranteed in the rebranded events. We won´t know for sure whether the guarantees for the BIG Fish tournaments will be maintained until the XL Inferno series comes to a close. However, we will have no hesitation in taking advantage of the opportunities to win a big prize for a small investment while it still exists – especially as 888 Poker is hosting some very generous promotions at the minute to support the XL Inferno series. We suggest you head over to 888 Poker as well to take advantage of the opportunities while they still exist.